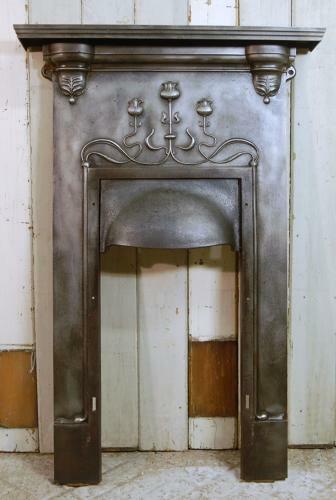 A very pretty, cast iron, Art Nouveau combination fire front. The fire is beautifully designed with large flowers, typical of the era, on the cross bar. The mantel has a stepped border and decorative corbels, with fanned detailing, below. The fire has a particuarly attractive domed smoke hood. The cast iron has been burnished and lacquered giving the fire a stylish silvery finish. The back of the fire has an RD number, RD398114, dating the fire to 1902. The fire is the perfect size for a bedroom and can be used in conjunction with a fire brick and fire stool. The fire front is missing the original front bars and this leaves rectangular holes on the legs where they were fitted. We can order new front bars for AN EXTRA CHARGE, please contact us for information. The fire is antique and therfore has some signs of wear consistent with age. There is some tarnish and slight rust patches to the front face and mantel. The fire has some casting marks and pitting. Scratching and marks due to age. There are some knocks to the feet. The fire does have a stain on one leg. There are some small fixing holes near the fire opening that wont show too much when mounted to a wall. We can fill the holes using dome head bolts, free of charge if required, please let us know at time of purchase if you would like this service. The back has some surface rust as expected. A stunning fire front that would be desireable for any style of home.